Real output growth is a central economic indicator for all policy makers. It defines the business cycle, establishes the timing of recessions, and largely drives discretionary fiscal and monetary policy decisions. The lack of timely reporting of quarterly GDP in some countries presents difficulties in the assessment of current economic conditions, and has fomented a growing literature that “nowcasts” GDP at higher (monthly) frequencies and anticipates quarterly data releases.2 While increasingly rare among emerging market economies, many countries do not report quarterly GDP growth at all—a number of these cases are found in the Caribbean, and the availability of timely indicators of economic activity is even more important for policy makers in these economies. This study proposes a framework that combines nowcasting econometric techniques with data that takes advantage of the geographic characteristics of Caribbean economies to estimate quarterly GDP growth rates. Caribbean economies exhibit a number of characteristics that aid the statistical inference of their quarterly output growth. First, as islands, commercial shipping dominates the transport of their external trade in goods, hence providing more accurate and timely measures of trade than overland routes for other countries. Second, external trade tends to reflect a large proportion of internal consumption and investment, as these economies are relatively small and specialized, and hence they import a large part of their consumption basket and investment goods. Thus trade generally mirrors economic activity in the wider economy. Third, their geographic proximity to the U.S. and various trade treaties implies that most of their trade is with the United States, and to a lesser extent the EU and China, all of which publish accurate and timely bilateral trade data. Fourth, one of their dominant industries is tourism, for which at least summary statistics are accurately measured and published on a timely basis.3 Moreover, this sector closely links an important part of Caribbean economic activity to labor conditions in advanced economies, for which there is broad data availability. Finally, idiosyncratic regional exposure to factors such as hurricanes and extreme weather events, advanced economy financial sectors, or remittances, among others, also lends itself to timely measurement and reporting. Among the larger Caribbean economies, many already produce and publish quarterly Gross Domestic Output, such as Jamaica or the Dominican Republic. Others, such as Guadeloupe, Turks and Caicos Islands, or Puerto Rico are not separate political entities, and hence, their economic activity is largely reported by other (OECD) economies to varying degrees. As a result, this study focuses on Cuba and The Bahamas, two larger Caribbean economies that do not publish quarterly GDP and for which the aforementioned conditions, such as geographic proximity to the U.S. or dependence on tourism, are likely to aid in quarterly GDP estimation. Annual GDP data published by national authorities in both countries can be delayed as much as six months. Hence, in the early part of any given year, the latest official information on national economic activity can be as much as eighteen months old. Nonetheless, a large number of aforementioned indicators are released more frequently and are available with a shorter lag. Arguably, policy makers likely already use these indicators in their assessment of the economy. No systematic analysis of the impact on policy of changes in short-term has been made public, only ad-hoc references and, in some cases, official announcements being available. To address these problems, this study creates a quarterly model of GDP growth for Cuba and The Bahamas using higher frequency indicators. The framework adopts the parametric dynamic factor model (DFM) to summarize a large number of indicators to produce a quarterly GDP series. This model can be used to assess recent economic developments and provide short-term quarterly forecasts of GDP. The proposed analytical framework provides a more timely assessment of GDP, and can be updated on an ongoing basis as new data are released and indicators are updated. The model results help shed light on the impact of the crisis that began in 2007 on these economies. Official data released by Cuban authorities reported aggregate 2009 GDP growth of 1.3 percent, compared to 5 percent in 2008.4 The nowcast shows, however, that the annual figure masks a very strong output decline in the last quarter of 2008 and the first quarter of 2009, followed by moderate recovery. 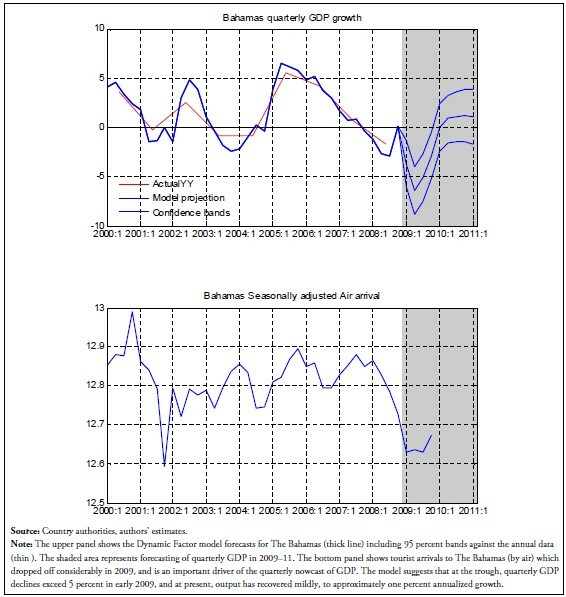 The quarterly path for The Bahamas similarly displays a very sharp decline in output in the first quarter of 2009 (a contraction exceeding 5 percent on an annualized basis), with a moderate recovery appearing only in the last quarter of 2009. For 2010, the model predicts a moderate improvement in short-term GDP growth for both countries. Cuba is projected to increase growth from 1.3 percent in 2009 to approximately 2.5 percent in 2010, and The Bahamas is projected to rise from -4.7 percent in 2009 to under 1 percent in 2010. Sustained high U.S. unemployment and low U.S. growth appears to be weighing down on the forecasts for both countries through 2010, and a prolonged period of very low growth is forecasted for the next two years on the basis of existing data. The next section outlines the modeling methodology. This is followed by an overview of the data, which is detailed in the Appendixes, and testing of the model, including forecast comparisons of the proposed dynamic factor model with comparator forecasting models, and summary of results. The last section concludes. This section presents the dynamic factor model employed for nowcasting and forecasting quarterly GDP growth. Generally, the estimation procedure can be separated into the following four steps. First, the Dynamic Factor Model (DFM) is estimated based on the unbalanced dataset. Second, the Kalman filter recursion is used to help predict the missing observations to produce a balanced panel. 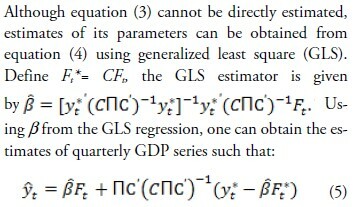 Third, the factors are re-estimated based on the new balanced panel.5 Finally, the quarterly GDP series are computed based on Chow and Lin’s (1971) interpolation procedure. The second and third steps are critical for filling in missing observations for both past and current (as yet unreported) series. 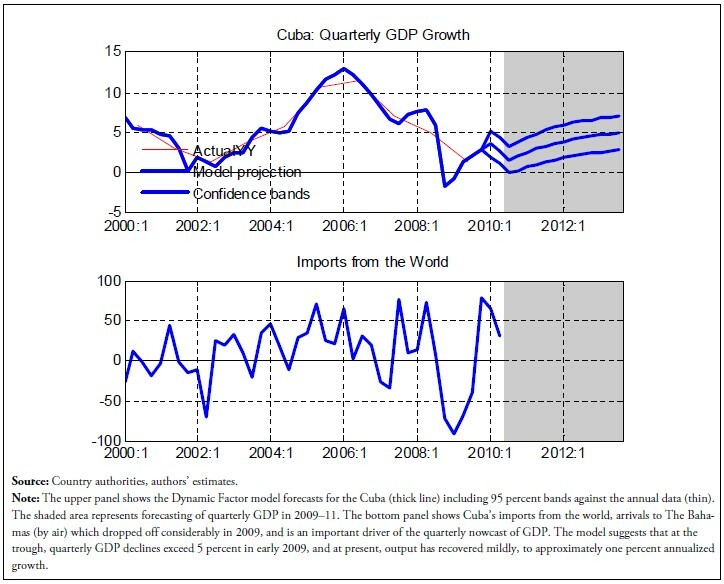 This is illustrated in Figure 1, which shows missing data for Cuba in a quarterly sample of 77 series from 1980 to 2010. A naturally occurring “rugged edge” appears in the dataset as a result of the asynchronous timing of new data releases and differences in historical data availability. The Dynamic Factor Model addresses these by “filling” in the missing observations recursively using the estimated factors, which are shown in the figure as white area. The Kalman smoother is then used to fill backwards and forwards missing values based on information in the entire dataset, and thereby produce a balanced panel. where A (L) is an pth order matrix polynomial, B is a k X q matrix of full rank q, and ut is a vector of uncorrelated white noise shocks.6 In the model, we assume three common factors (k), two pervasive common shocks (q), and two lags for the VAR. The DFM described in equations (1) and (2) is estimated using the two-step procedure described in Giannone et al (2008). First, based on the balanced data panel, estimate the common factors using the principal component method and the VAR coefficients using ordinary least square (OLS). Next, given the initial parameter estimates, apply the Kalman filter to the entire data set (including missing observations), and re-estimate the factors. For missing observations, the implicit signal extraction process of the filter will place no weight on that variable in the computation of the factors in time t. Finally, we fill in the missing observations using the estimated factors (via equation (1)). These steps are repeated until there is no further change to the estimated factors. yt can be decomposed into two components: (i) the conditional expectation of quarterly GDP (yt) give the common factors (Ft); and (ii) the redistribution of the annual prediction error into quarterly prediction errors. The second component ensures the aggregated quarterly series coincide with the observed annual series. Lastly, we substitute the forecast of the common factors into equation (5) to obtain the forecast of quarterly GDP. 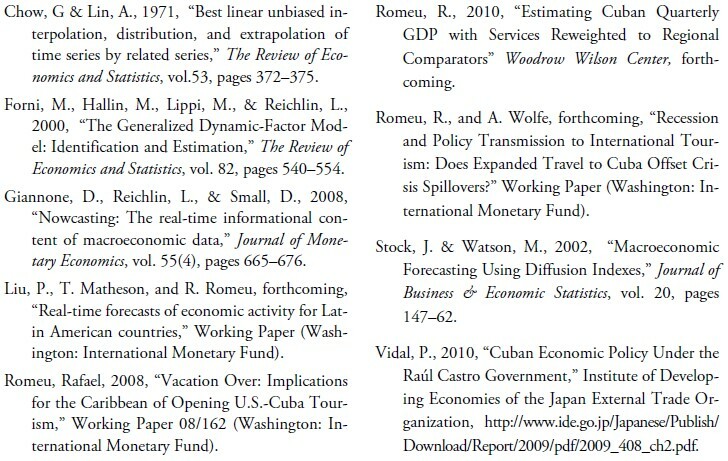 The quarterly dataset used to project quarterly GDP consists of trade and financial variables for Cuba and The Bahamas, which are detailed in the Appendix. For The Bahamas, the Dynamic Factor Model summarizes approximately 130 monthly and quarterly indicators, of which roughly one-half are direct indicators of domestic activity in The Bahamas, such as electricity generation or manufacturing. The rest of the variables included for The Bahamas are indicators of the U.S. economy, which carry a particularly important weight for The Bahamas given its close proximity and its heavy dependence on tourism from U.S. residents. The influence of the U.S. on the Cuban economy is less direct, particularly because of limited direct trade. Nonetheless, the impact of shocks to the U.S. is felt in the Cuban economy indirectly through world financial variables, commodity prices, tourism indicators, and hence, these are included for Cuba. In addition, weather and natural disasters are included, as are income measures for residents abroad which are intended to reflect remittances in both countries. 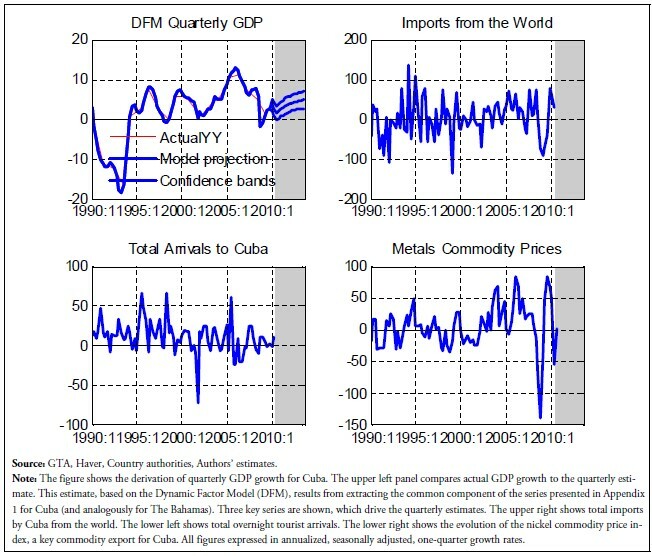 The median of the change in the underlying indicator variables (shown in the Appendix for Cuba), summarizes the overall change that the dynamic factor model captures. The median indicator changes suggest a slowing down of activity in 2008–09, with a recovery in late 2009, but a return to slow growth in 2010. The strong variation within some of the available series is eliminated by the factor modeling, which produces the common component of the available series. To get a feel for the modeling results presented below, Figure 2 shows the derivation of quarterly GDP growth for Cuba.7 The upper left panel compares actual GDP growth to the quarterly estimate. 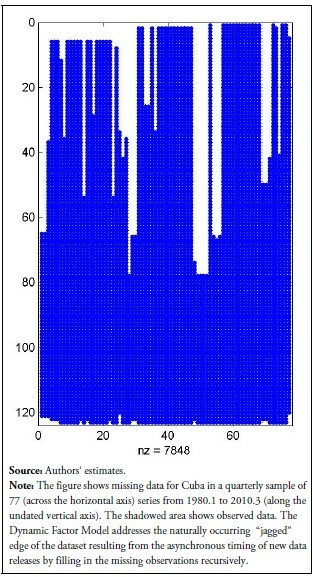 This estimate, based on the Dynamic Factor Model (DFM), results from extracting the common component of the series presented in Appendix 1 for Cuba (and Appendix 2 for The Bahamas). Three key series are shown, which drive the quarterly estimates. 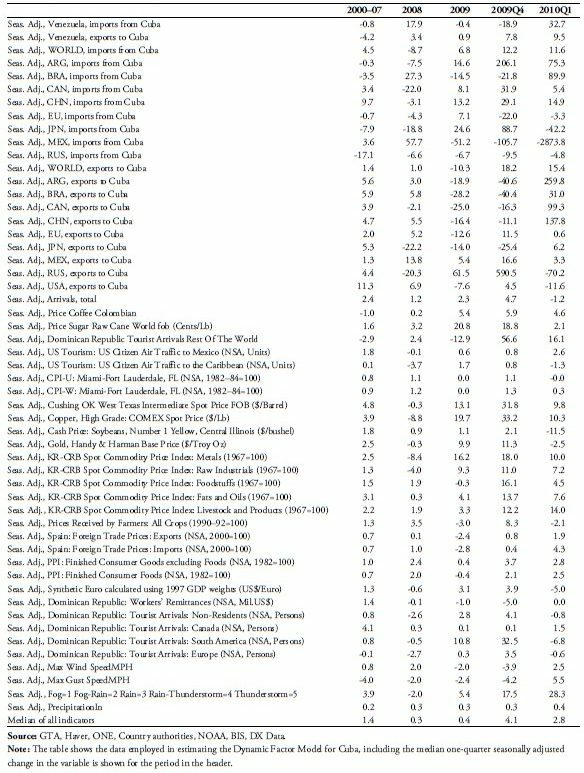 The upper right shows total imports by Cuba from the world. The lower left shows total overnight tourist arrivals. The lower right shows the evolution of the nickel commodity price index, a key commodity export for Cuba. 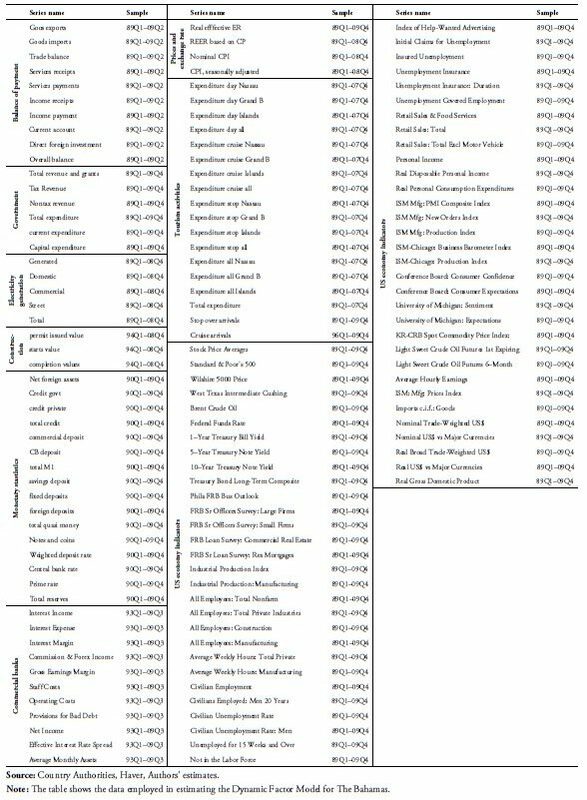 The DFM brings all the underlying series to the present (fills in the missing variables) and estimates quarterly GDP based on the common components of all the underlying series, of which three are shown. The initial empirical test of the model is presented in Figure 3, which compares out-of-sample forecast for the DFM with two Bivariate Vector Auto-regression models (BiVAR). 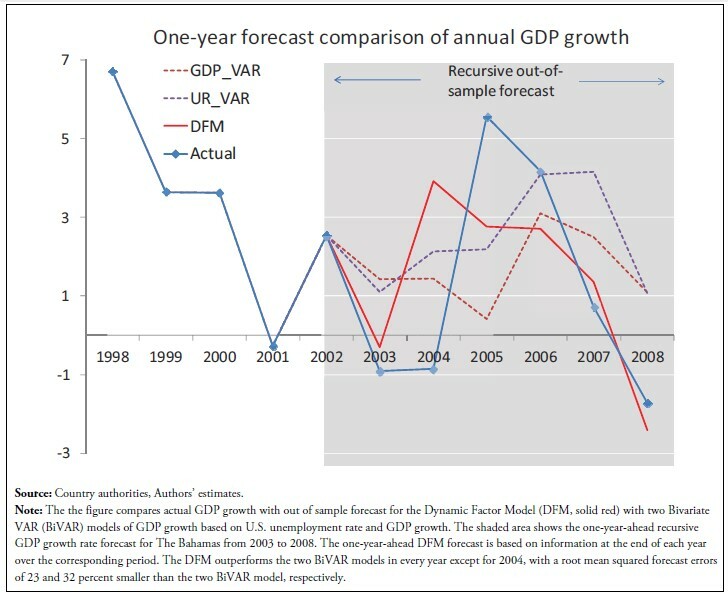 The first BiVAR model consists of annual GDP growth for The Bahamas and the U.S unemployment rate, while the second consists of annual GDP growth for The Bahamas and the U.S.8 The figure shows the one-year-ahead forecast of GDP growth for The Bahamas from 2003 to 2008 for all three models, with the DFM forecast based on information at the end of each year over the corresponding period. The results show that the DFM outperforms the two BiVAR models in every year except for 2004. The root mean squared forecast errors of the DFM is 23 and 32 percent smaller than the Bi- VAR model based on U.S. unemployment rate and GDP growth. 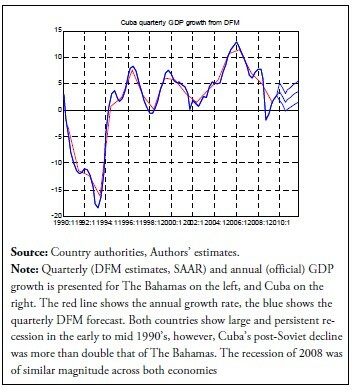 Figure 4 compares the long-term estimates of quarterly GDP for The Bahamas and Cuba with the official annual data. Both countries show large and persistent recession in the early to mid 1990s, however, Cuba’s post-Soviet decline was more than double that of The Bahamas. This deep recession in the early 1990s illustrates the large quarterly declines that occurred within the year but are masked by the averaging that occurs in the official annual growth. For both countries, the trough of the recession in the early 1990s was significantly deeper than the reported annual decline (-8 percent for The Bahamas and -18 percent for Cuba). In addition, the figure shows the similarity in the sharp and rapid downturn experienced by both countries in the wake of the 2007/08 global financial crisis. Figure 5 shows the Dynamic Factor model forecast for The Bahamas, including 95 percent bands against the annual data. The shaded area represents forecasting of quarterly GDP in 2009–11. The bottom panel shows tourist arrivals to The Bahamas (by air) which dropped off considerably in 2009, and is an important driver of the quarterly nowcast of GDP. The model suggests that at the trough, quarterly GDP declines exceeded 5 percent in early 2009, and at present, output has recovered mildly, to approximately one percent annualized growth. Similarly, Figure 6 shows the Dynamic Factor model forecast for Cuba, with 95 percent bands also shown and graphed against the annual data. For Cuba, the bottom panel shows imports from the world, which is traditionally a key indicator of activity due in part to hard currency financing constraints, and which dropped off considerably in 2009. The model suggests that at the trough, quarterly GDP declined by approximately 2 percent at the end of 2008 and into 2009 in Cuba. In addition, estimates of output in 2010 suggest a mild recovered and a risk of a return to recessionary conditions, with seasonally adjusted annualized GDP growth estimated at approximately one percent. This paper proposes a framework for nowcasting and forecasting quarterly real GDP growth using a Dynamic Factor Model for Cuba and The Bahamas, countries which at present do not report quarterly output growth. The study employs several characteristics idiosyncratic to Caribbean countries that are particularly useful in estimating quarterly growth using the Dynamic Factor Model, including proximity to the U.S., the fact that they are islands, and trade treaties, among others. Estimates of the proposed model are evaluated against two simple Bivariate Vector Autoregressions, and the latter are found to underperform relative to the DFM. The model estimations also shed light on both the depth and breadth of past recessions in both countries and the more recent impact of the global financial crisis. Both countries suffered historically large and prolonged recessions in the early part of the 1990s. During these, the reported annual declines in output did not exceeded 6 percent for The Bahamas, fluctuated between 10 and 15 percent for Cuba. The DFM estimates, however, show growth odeclines approaching 8 percent during this period for The Bahamas and nearly 20 percent in some quarters for Cuba. Hence, unsurprisingly, the annual growth tends to understate the depth of the contractions during some quarters of this period. For the global financial crisis that began in 2007/08, the DFM model estimates show a very rapid decline in GDP in both countries, with a particularly pronounced drop coinciding with the turmoil in the last quarter of 2008 and the first quarter of 2009. Moreover, both countries are currently facing very slow recoveries with projected growth rates under 3 percent for 2010. 1. International Monetary Fund, Western Hemisphere and Fiscal Affairs Departments, respectively. The views expressed are those of the authors and do not necessarily represent those of the IMF or IMF policy. 2. See, for example, Liu, Matheson and Romeu (2010) on nowcasting monthly GDP in Latin America and the Caribbean. 3. See Romeu (2008) on the influence of trade treaties, natural disasters, and tourism for Caribbean economies. 4. Official GDP in Cuba is heavily weighted towards services (over 80 percent), which is higher than in the rest of Latin American and the Caribbean. To address the potential overweighting, Romeu (2010) compares nowcasts of official GDP and an unofficial (reweighted) Cuban GDP based on the services weight for the Dominican Republic. 5. In practice, steps two and three are repeated until there is little change to the estimated factor. 6. The uncorrelated white noise restriction is shown to help improve the forecasting performance of the DFM. 7. Without loss of generality, the section presents general results pertaining to the DFM quarterly GDP nowcasting model alternatively for Cuba or The Bahamas, but not both. 8. See Romeu and Wolfe (2010) for the links of tourism to OECD employment conditions driving this choice for the BiVAR for The Bahamas. Philip Liu is an economist with the International Monetary Fund.